Depending on what solar cooker brand, or kind of solar cooker, will determine best suggestions you can use to mitigate the problem of wind. The most commons solar cooker, the Global Sun Oven can really have issues with the wind when the leveling leg is fully extended, making this cooker very susceptible to tipping. 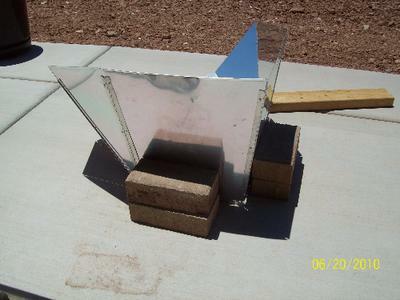 One of the quickest and easiest ways to brace the GSO is to used bricks, cinder blocks or logs placed firmly against each side of the solar oven, including the back leg. Usually this will help prevent any tipping or toppling of the GSO, but every once in a while we will get a very strong micro burst of wind that will still catch on of our Sun Ovens and tip it despite the bracing and stabilizing. We have heard from many customers that have used bungee cords to secure their Sun Ovens by attaching anchors, or drilling holes into the wood collar of the Sun Oven, and then using a sized right piece of plywood underneath the sun oven with anchor bolts screwed into the plywood. They will then attach the bungee cords on the oven and plywood anchor bolts, making it a very secure setup for cooking. Solar Panel Cookers such as the Cookit, Copenhagen Lite and many windshield shade panel cookers are very light and somewhat flimsy in design and structure and so it can be challenging to brace these. The windshield cookers can be braced by setting rocks on the edges and inside of the panel as well as using a large opening bucket so that they can rest down inside of the bucket. And some people will use rope, string and wire to create guy lines (lines used to secure tent poles etc.) on the panels to keep them stable and immobile. The Copenhagen Lite is made of more rigid materials and is quite aerodynamic so it usually handles wind quite well, but like all others does need some stabilization nonetheless. The Hot Pot is a panel cooker as well, but it is made of rigid aluminum panels and uses a heavy glass/steel pot, so it is a little more immune to the movements of wind, but it is also stabilized using bricks, blocks etc. on the sides of the panels similar to the GSO. There are just as many methods and ways of securing a solar cooker against wind as there are classes and kinds of solar cookers, so each one may have a slight variation on the methods and means of securing each solar cooker. We would love to hear of other peoples tips, tricks and solutions to this common challenge to solar cooking.